Okay, another training aid to look at. One of many that I am asked to evaluate and frankly at first I doubted it would be of any help in my seemingly never-ending quest towards a perfect game. But from the first time I put EyeLoc on I saw I was wrong. EyeLoc is a pair of sunglasses but with a significant difference. A vertical slot cut in the center of each lens results in the wearer seeing two lines. The idea then is to take your address position and move the position of the two slots by turning the adjustment knobs on the frame until they align and you see just one line with the ball in the center. Easy, simple and significant since when hitting the ball if you see the ball move from the line (it’s slightly wider than the ball) your head has moved rather than staying steady. Realizing at once this would be a big help during putting practice I tried it out and was right. 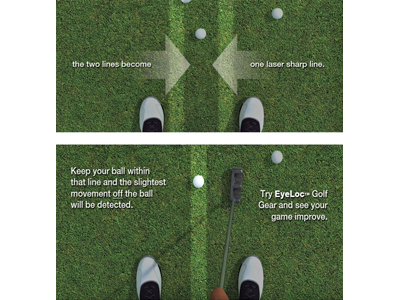 Any head movement was instantly obvious so time on the practice green with EyeLoc will train you to keep both eyes and head steady which of course is a major factor in making more putts. Having seen the benefits on the putting green I went to the practice tee to find out what movement—if any—I had in my full swing and right away I found the answer was, “a lot.” So now I am using EyeLoc to train myself to make a better swing, more around instead of the old slide and glide. Admittedly it’s a work in progress but I can see results…much better ball contact, distance and trajectory. At $80 EyeLoc is not inexpensive but with consistent practice the improvement to your ball striking should be more than recovered from winning wagers plus of course, this game is a lot more fun when you hit the ball solidly and make lower scores.